Greetings, forex friends! The first Friday of the new month is fast approaching, which means another non-farm payrolls (NFP) report is coming our way tomorrow at 12:30 pm GMT. And if you’re planning to trade that top-tier event, then you better gear up by reading up on another edition of my Event Preview. The August NFP report was positive overall. As for specifics, the report revealed that a net of 201K non-farm jobs were generated in August, beating expectations for a 193K increase. But on a more downbeat note, the June reading was downgraded from +157K to +147K, and the reading for May was also revised lower from from +248K to +208K. That means that the U.S. economy generated 50K less jobs than originally estimated. Despite the downgrades, the jobless rate held steady at 3.9%, even though the labor force participation also fell from 62.9% to 62.7%. What made the August NFP report really shine, however, are the readings for wage growth. You see average hourly earnings increased by 0.4% month-on-month in August, beating expectations for a 0.2% increase. The year-on-year reading is even better since that came in at +2.92%, which is the best reading since May 2008. In summary, the August NFP report revealed that non-farm payrolls and monthly wage growth both exceeded expectations, so the Greenback jumped higher across the board as a knee-jerk reaction. However, a closer look at the details showed that the U.S. economy generated 50K less jobs than originally estimated, so bears fought back. Bulls eventually won out, though, since the report was still positive overall. And the readings for wage growth, in particular, were rather impressive. For the upcoming NFP report, most economists forecast that only 185K non-farm jobs were generated in September, which is a bit less compared to the +201K created in August. There is also a consensus that the increase in jobs will be enough to push the jobless rate down from 3.9% to 3.8%. Moreover, there is also a consensus that wage growth only increased by 0.3%, slightly weaker compared to the impressive 0.4% month-on-month increase recorded in August. So, what do the leading labor indicators have to say? ISM contradicts Markit’s findings since the employment sub-index of ISM’s manufacturing PMI report rose slightly from 58.5 to 58.8, which means that employment grew at a slightly faster pace. ISM supports Markit’s findings since the employment sub-index of ISM’s non-manufacturing PMI report jumped by 5.7 index points tp 62.4. The September ADP report showed that private non-farm jobs increased by 230K, much more than the expected 185K increase. The details of the report also showed that both the manufacturing and service sectors printed stronger jobs growth. What about historical tendencies? Do they offer additional insights? 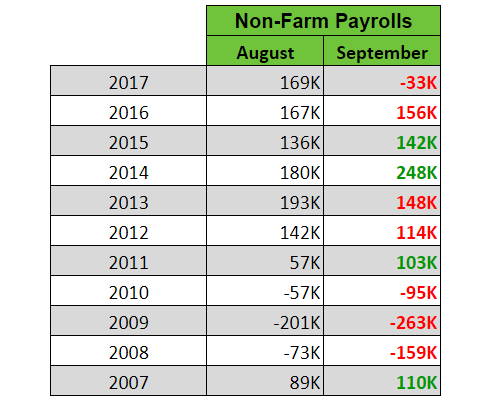 Well, there are more instances where the NFP reading for September is weaker compared to the August reading, so the consensus that jobs growth slowed does seem to have a historical basis. However, economists also have a tendency to be too optimistic with their guesstimates since there are more downside surprises than upside surprises. As for wage growth, the consensus that wage growth slowed also appears to be supported by historical data. And economists also appear to have a tendency to overshoot their guesstimates for wage growth. To summarize, economists forecast that jobs growth slowed in September. And the consensus view is supported by historical data. Historical tendencies also show that economists tend to overshoot their guesstimates, resulting in more downside surprises. And that skews probability slightly more towards a potential downside surprise. But as always, just keep in mind that we’re playing with probabilities here, so there’s always a chance that jobs growth may surprise to the upside instead. Also, almost all of the available leading indicators were pointing to stronger jobs growth in September. And there have been instances of upside surprises, so an upside surprise is still possible. As for wage growth, the consensus that wage growth slowed also has a historical basis and historical data also show that economists tend to overshoot their guesstimates, which also skews probability more towards a possible downside surprise. And unfortunately, the available leading indicators don’t offer much in terms of clues. At any rate, just keep in mind that traders usually (but not always) have their sights on non-farm payrolls. However, wage growth also has a role to play, especially when determining follow-through buying or selling after the initial knee-jerk reaction. And if news trading ain’t your thing or if high volatility makes you uncomfortable, then just remember that you always have the option to sit on the sidelines and wait for things to settle down.